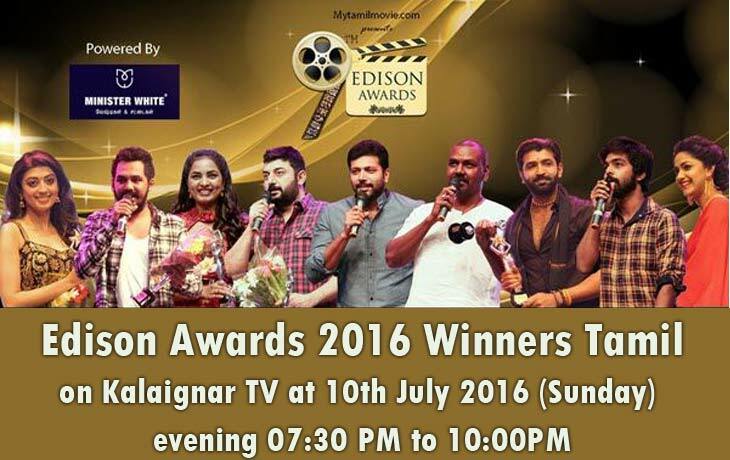 Edison Awards 2016 Winners Tamil: Here, it is another grand annual award event for Indian Cinema Industry. The Tamil Edison Awards 2016 was held at Chennai on 14th February 2016 (Sunday). Edison Awards is named for the memorable of Inventor of Cinema “Thomas Alva Edison.” All the 21 categories are presented to the Tamil cinema artist and technicians. This is the Ninth Edition of Edison Annual Awards. This Award function will be telecast in the channel of Kalaignar TV at 10th July 2016 (Sunday) evening 07:30 PM to 10:00 PM. Scroll down and read the entire Edison Awards 2016 Winners list of Kollywood Industry. This Ninth Edison Awards 2016 was held in Chennai on February 14, 2016. The 9th Edison Awards will be telecasted tomorrow on Tamil TV channel, which is Kalaignar TV as per the scheduled time of the evening. The Internet viewers can able to watch this Streaming as Live from the given link here above. Stay tuned and share this Edison Awards 2016 Winners List of Tamil (Kollywood) to your friends.